Finished a 30 man German warband. A mix of Foundry and Black Tree figures and shields. As with the others, I'll go back and add designs to the shields once I've got enough figures to field 2000 points. After starting off strong & ahead of schedule, I'm now behind on everything due to various uncontrollable circumstances. I've got some commission work I need to finish too. So I'm worried about getting everything done for the WAB doubles. Back to the miniatures... I did rush them a little bit, but I really like the sculpts. A few of the BTD figures don't seem to match the rest. They almost look like cavemen moonlighting as Germans. Some of them, though, are almost indistinguishable from their Foundry counterparts. I'm trying to keep the colors dark & earthy. 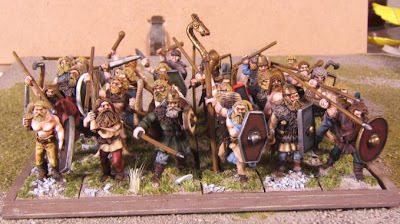 Exellent work, I've been wanting to see some nicely painted Germans for a while and these look great. I have my own Warbands to start but painting has slowed down for me at the moment. Great to see the Warbands in the flesh though, nice work.